In April 1945, General Dwight Eisenhower arrived in Gotha, Germany, at the head of an American army. On the outskirts of the city, he led the way into a forced labor camp. What they discovered there made accompanying General George Patton physically sick. Other battle-hardened members of the military couldn't bear to investigate inside the squalid barracks. They were distressed enough by what was in the open air. Eisenhower forced himself to see it all, visiting 'every nook and cranny'. He ordered local civilians from Gotha to march through the camp and also witness it. He sent detailed reports back to Washington, and recommended that US and British journalists be dispatched to the site forthwith. Why? Eisenhower had made a startling prediction. One day people would deny this ever happened. They would call it propaganda. It would be beholden on those who were there to provide the evidence. He was right. "I Don't Understand How People Can Deny the Holocaust!" This week has seen a Holocaust denier trolling the pages of Wizzley. Therefore this is a statement with its variants in many private discussions recently. Encountering someone who denies that the Holocaust took place can be a bewildering experience. 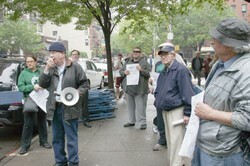 The knee-jerk reaction is disbelief, whether it's John Thames trolling through comments on Wizzley; the likes of Michael Santomauro (pictured left) taking a megaphone to East 85th Street in Manhattan; or high profile court cases, like David Irving losing a libel action against Deborah Lipstradt. All week, I've had people reading the diatribes of John Thames and turning to me with that same puzzled reaction. It's been a weird, almost surreal encounter, watching pseudo-histories tumble out, not a shred of which stands up to the slightest scrutiny. You didn't need to be a qualified historian to work out that, nor to discern where opinion masqueraded as truth. A quick internet search destroyed most declarations. As far as I can ascertain, not a single person was convinced by the blatant dot joining of wildly irrelevant or selective facts. In fact, the majority of people were largely doing the cyber equivalent of munching on popcorn, while rubber-necking the bizarre exchanges. Many were taking informal bets on when or if I'd finally take him down. And/or speculating on whether this was merely a troll, who didn't believe his own rubbish, but knew it would get a reaction; or if there was real insanity/mania/delusion at work. Delusion was definitely a top choice. But I remain concerned about darker motives. 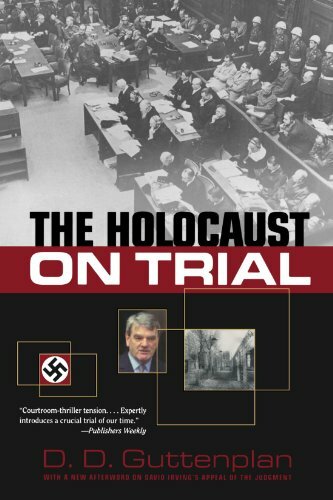 After all, I am probably the current resident Holocaust expert on Wizzley (I achieved my BA (Hons) in History studying this period, culminating in a dissertation on the Porajmos). I know how these things can escalate. No-one who ever denies the Holocaust will ever state it outright. They prefer to use terms like 'Holocaust Revisionist' and say that they're here for a 'debate'. In fact, there is a distinct difference between denial and revisionism. The latter can easily be a valued and credible route into studies of the Holocaust. Holocaust Deniers will state that there was no genocide under the Third Reich between 1939-1945. They may agree that camps were established, and that up to tens of thousands of people lost their lives. However, they deny the key fact that millions entered the gas chambers in places like Auschwitz. 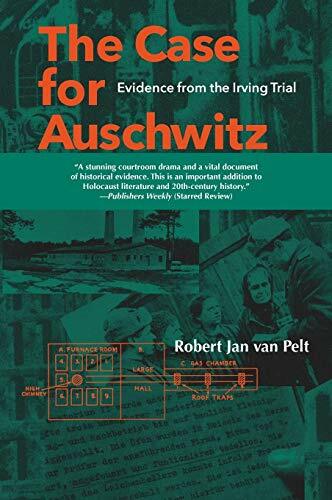 Holocaust Revisionists will look at the documentary evidence and ask pertinent questions like 'how far was Adolf Hitler aware of what was going on?' Their conclusions may turn established history on its head, thus revising the known facts. But frankly, that is the nature of historical investigation. In both cases - as with all history - proponents must be prepared to produce the evidence. That has to stand up to academic scrutiny. Some revised histories will be accepted, and some will revert back to previous conclusions. The sheer wealth of evidence means that deniers of the Holocaust always fall under peer review. As any thirteen-year-old on a forum knows, denying the Holocaust is a sure-fire way to cause mass consternation and grab some serious attention. After all, the target readership might have well have just been asked to believe that the color blue no longer exists in the world, or that said world is now flat again. Denying the Holocaust really is that ludicrous. It rears up in the face of insurmountable evidence, throwing flawed arguments and speculative lapses of logic as its only ammunition. It's hardly worth shouting it down. Nevertheless, there's plenty of information on the internet, should anyone have actually been convinced by any of the anti-Holocaust arguments. You could browse Wikipedia, for the layman's level of rebuttal; or you could delve into the archives of the Nikzor Project for more in-depth responses. 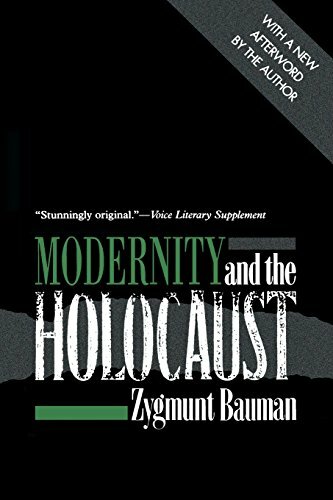 The latter grew out of a Usenet forum, founded by Canadian activist Ken McVay, who realized there was a real and present need for someone to tackle the pseudo-histories of Holocaust deniers head on. All of the main arguments used by such people are there, each carefully bombarded with evidence as to why they are ridiculous. The Nikzor Project being even vaguely necessary is a good indication of whether your Holocaust denier is a troll or more serious about their proclamations. The average troll isn't even trying to sound academic about it. There's no reference to 'essays' or other scholarly media. They merely say that the Holocaust never occurred, then sit back to enjoy the drama. It's immaturity at work, nothing more and nothing less. They'll grow out of it faster, if you don't feed them attention. There's something quite fundamentally human about finding your 'tribe', and powerfully satisfying about being in on the big 'secret'. Imagine that you felt quite alone. You'd never been part of the 'in' crowd. You'd flunked school and you were now stuck in a dead end, menial job, or were terminally unemployed. People tended to think of you as a bit of a joke, if they thought of you at all. Now imagine that someone came along and invited you to be part of an international movement, perhaps with local meetings. You could hook up with fun, like-minded people on a weekly or monthly basis. Part of something. Belonging. Imagine if that came complete with a huge revelation. Something which you could grasp, but had eluded the majority of people. 'Sheep' believe anything, but you've seen scholarly papers (helpfully omitting confusing academia, and not requiring any prior understanding nor context at all) and you know the truth. How clever do you feel now? How superior to all who ever wrote you off as a loser? How wonderful is that sense of knowing something huge? Some people deny the Holocaust because they fit the above profile and were targeted by recruiters. They constitute the rank and file. People who can hold placards and swell the numbers in conference halls. They'll get the word out by spamming forums, citing precisely those 'essays' that convinced them in the first place. They're not required to think. Students imply future academics. Their papers can be used to fill the archives with more essays that look the part, even if they won't stand up to much scrutiny of the evidence. These people deserve our pity, compassion and help. They're being exploited. They don't care a jot for the central issue, other than the fact that it makes them feel so included in the world. They couldn't debate their way out of a paper bag, but they are usually the public face of the whole movement. Denying the Holocaust to gain a sense of self-worth opens up a whole new can of worms. If they wake up to what they're doing, then they can add the crashing defeat of realizing their gullibility to the rest of their issues. It's a lose-lose situation. What did YOUR country do to stop the genocides taking place in Europe during the Second World War? This was precisely the reason that General Eisenhower predicted that the Holocaust would one day be subject to denial. We can all be wise after the fact, but our governments had to make decisions based on what they felt was right at the time. Thus is it with the Holocaust. I can remember being incensed for a long time about Britain's role in all of this. Why on Earth hadn't Britain just bombed the blooming railway tracks leading into Auschwitz?! Churchill's government was well aware of the atrocities, and our planes were certainly in the vicinity. It took a recent trip to Auschwitz to finally put that specter to bed. Apparently British planes wouldn't have had the fuel capacity to make it that far into Poland until quite late in the war. It wasn't like they could stop and refuel in Germany. Plus the lack of precision bombing meant that British bombs could just have easily drifted off course to blow up the barracks. Now that REALLY would have looked great in the history books, wouldn't it? But at least the British have the perceived moral high ground of being able to say that we were fighting from the beginning, and did all that was possible to end the Holocaust simply by winning the war. There's plenty to debate in those statements, yet the fact remains that today's British can feel a bit smug when asked what their parents/grandparents did to stop the Holocaust. What about those countries which stayed out of the Second World War until close to the end? Or those who colluded with the Nazis? Just yesterday (at the time of writing), Romanian President Traian Basescu admitted that his country has seriously struggled with Holocaust denial, because of that very reason. Nor is it any accident that a disproportionate number of Holocaust Deniers are German or of German descent. They have much more national guilt to play down than any other state. Denying the Holocaust - because it reduces the perceived greatness of your country - is found more in Eastern Europe than the West, but it does exist in the latter too. Particularly in the USA. It's much, much easier to pretend that the Holocaust never happened, than to admit that your nation's policies may have been flawed, your grandparents complicit and/or your military unable to protect its civilians. And Britons, you wouldn't look nearly so smug if you'd studied this quite as much as I had. We still weren't all that great. Nor does it get us off the hook over the British Empire. In January 2014, Jews in Hungary took exception to Sandor Szakaly suggesting that the Holocaust didn't quite happen according to the history books in Hungary. Make no mistake, acceptance or denial of the Holocaust can have far-reaching political consequences. If we condemn that genocide, then what about all of the others? Antisemitism is generally cited as the number one reason for denying the Holocaust. Proponents know it happened. They just need it to go away, so they can do it again. 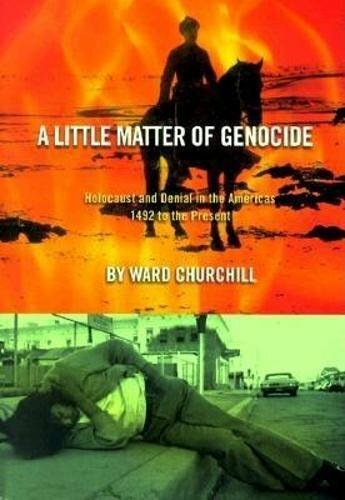 The Holocaust - or a genocide very like it - can and will happen again. The best that any of us can say is 'not on my watch'. Perhaps the only silver lining of the Holocaust is that it now stands as a recent, vivid and perfect example of how racist policies can go too far. It's a very inconvenient entry in the historical record, for those who would do it all again. Much better to make it all go away. Post-Holocaust antisemitism has had to wrap itself in knots, in order to be taken seriously by anybody. "You want to include Jews in our society? Then YOU are antisemitic, not me!" They cry, continuing in the face of incredulous frowns, "Because if you don't separate them, then societal diversity will make them lose their culture! Dilute their bloodline! YOU WILL HAVE WIPED THE JEWS FROM THE EARTH, JUST BY INCLUDING THEM!!" And for 'Jews', please feel free to insert any other race different to the speaker. Or indeed, those of a different creed, political leaning or whatever else comes to mind. For a moment there, such twisted logic sounds superficially reasonable, until you realize that the natural outcome would be ghettos, camps or sealed off states. Anything which a) emphasizes race like it's not a meaningless distinction and b) promotes segregation. It makes it sound like concentration camps are a good idea. Many Holocaust Deniers hail from neo-Nazi, far-right or KKK-type backgrounds. For those members with keen intelligence, then the Holocaust can be used as a means to ensure that it happens again. All they have to do is persuade enough people that it didn't happen in the first place, or it was exaggerated, in order to allow its perceived victims to capitalize upon survivor pity. If a consensus could be reached to agree upon this, then mainstream society would naturally feel angry about the inherent duplicity. We would all turn against the Jews (and other 'undesirable' groups) and turn the other cheek, as the machinery of exclusion through to extermination kicked in again. It's a sad indictment of human nature that such a reading is probably correct. Society can all too easily turn against a sector of itself. History has provided countless examples of that over and over again. 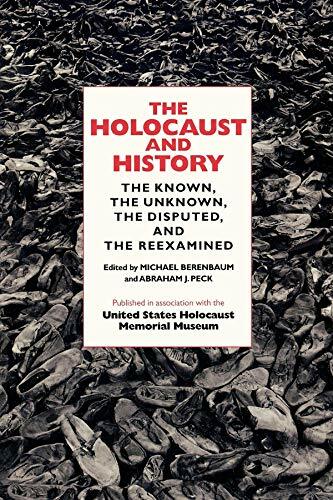 Currently the Holocaust - its place in living memory, its wealth of evidence, and majority acceptance that it did indeed happen - stands between us and the next time. No wonder the more insidious of antisemitic, and other racist, movements would have us deny it. Carefully inserted doubt shoots holes in the 'never again', but only if we let it. I conducted this interview for Holocaust Memorial Day 2014 with Eva Mozes Kor. At 30 mins, 13 secs, we talk about the troll on Wizzley. JT, you refer to my claim that for the conspiracy to work too many people would have to be involved and say that it is nonsense. But, speaking as a retired philosophy lecturer, I will tell you that nonsense only occurs when a sentence is semantically meaningless. There is nothing meaningless in what I said about the need for a massive conspiracy to to have happened. Not one post in this long dispute has made any nonsensical assertion, But your view of history is a grotesque parody of the truth. It is a vast falsehood concocted in the service of an evil movement, Nazism. Nazism was evil. Hitler invaded countries to steal their land and property, and to enslave their people.The aim of Grossdeutschland resulted in an attempt to steal much of Russia and twenty million dead. One who could ruthlessly wage war for aggrandisement would also casually dispose of many who were opposed to him. Evil creates hell on earth, and as Nazism was fundamentally evil then it created hell in its concentration camps. It could not do otherwise. I am German, my parents were Germans, we don't have any Jewish connections whatsoever nor were my parents involved in any Resistance during the Nazi time --- so how do you explain to me that my own parents told me that they, as completely average citizens with no political affiliation whatsoever, KNEW about the Holocaust as it happened aka 1938-45? They knew about the gassing / killings of Jews, POWs, Roma, disabled people etc whilst it was happening in Germany, not only afterwards. * Why did underground intelligence groups in the camps make no report back to their governments in exile regarding the so-called exterminations? The ghost of Witold Pilecki would be fascinated to know why you think they didn't. He first mentioned such exterminations in Auschwitz as early as 1941 in his reports. 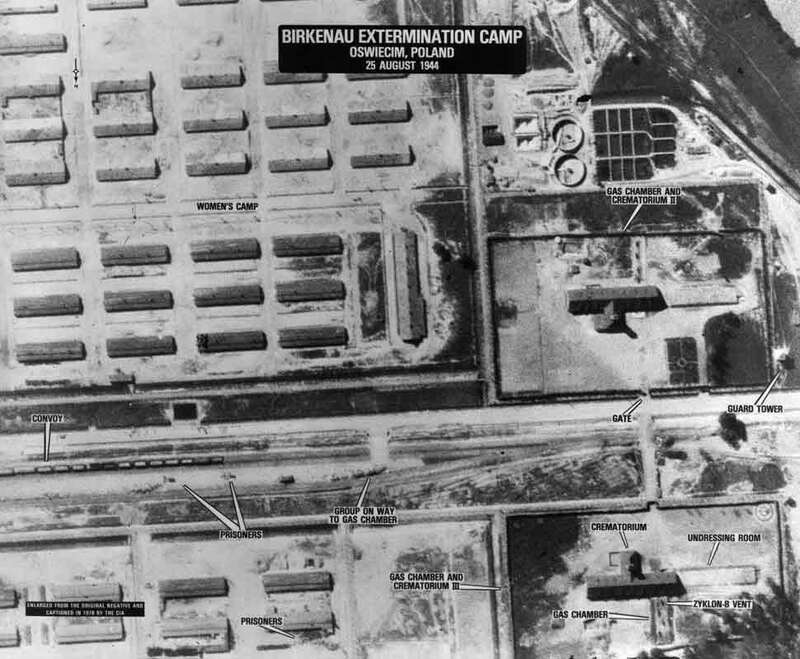 * How did Polish free labor employed in the camp overlook the supposed extermination? I'm sorry, I don't understand the question. Do you mean 'overlook' in the sense that they didn't notice it, or their barrack windows didn't have a view of the slaughter? By and large, the Polish prisoners were in Auschwitz I, which was by no means safe, but wasn't the purpose built death camp that was Auschwitz-Birkenau. They saw people die in their thousands, but not at the scale being enacted down the road. * Why did Heinrich Himmler issue an order that "the death rate in the camps be reduced at all costs"? He wrote that in a letter dated December 28th 1942, issued to all concentration camps, with a directive to pass the orders issued within to the relevant people (doctors, administrators etc.). It pertained to typhoid outbreaks in several camps and demanded that they do everything in their power to deal with the epidemics. Why? Two reasons. a) Typhus is contagious. SS guards and other staff worked in these camps. SS guards can catch typhus; and b) a lot of Reich wealth was being created by slave labor in a variety of occupations. The slaves were going to be worked to death anyway, but typhus was severely disrupting output. * Why did the Germans build huge hospital facilities in the camps to put sick Jews back to work? To engage in forced sterilizations; contain epidemics; and conduct medical experiments. Did you think those things happened in the street? I hope that you found these answers informative. Please do feel free to ask some more. John - You put the word survivor in quotation marks, thus implying that Eva Mozes Kor did not survive. I'd like to clarify the point that she was indeed still breathing during that interview (and afterwards). Eva is not a zombie. I have no need to ask Eva those questions, as I can answer them myself. * Why did the Germans build an extermination camp right in the middle of Polish villages and farmland? The first people incarcerated in Auschwitz were the Polish POWs. They were in Auschwitz I. This complex already existed, as it was originally a barracks for the Polish army, therefore entirely fit for purpose in housing lots of captured Polish soldiers. The Germans did add some infrastructure to it, but fundamentally it was around those brick barracks. Auschwitz II (aka Auschwitz-Birkenau) is a different story. When you say 'in the middle' you actually mean 'right on top of' Polish villages. The village of Birkenau was evacuated and demolished, in order that Auschwitz II may be purpose-built on top of it. Why? Because the cleared site, and surrounding farmland, afforded enough space within easy access of the existing Auschwitz I. There were also dozens of other sites dotted around the immediate area. But, with the exception of Auschwitz III, they tended to be smaller concerns. They were seized (and sometimes reconditioned) farms, industrial sites etc. Also you need to note that the Auschwitz complex was smack bang in the middle of a huge zone made safe for the Third Reich. By which I mean most of the properties were being used by SS guards and other personnel. The town of Auschwitz itself was mostly empty, on account of it once having had a majority Jewish population. * Why do US aerial photos show no sign of Jews being "gassed"? Because the aerial photos were taken by airplanes, which tend to be outside. The Jews (and others) were being gassed inside. There was a roof in the way. Sam - I very rarely take his comments down. The only instances have been when he's used strong language, which is against the rules of Wizzley, or (and this has only been the last two days) he's waffling on about Holocaust denial in the comments section of an article about the Titanic and Suffragettes. I gave him the option of coming here, which he has done. You do ask a good question though. Why didn't he respond to any of my questions? And why don't you answer the questions asked of you? Saying "As for the argument that too many people would have to be involved for such a conspiracy to work, that same nonsensical argument was made over Pearl Harbor." really isn't a factual answer at all. Why did the Germans build an extermination camp right in the middle of Polish villages and farmland? Why do US aerial photos show no sign of Jews being "gassed"? Why did underground intelligence groups in the camps make no report back to their governments in exile regarding the so-called exterminations? How did Polish free labor employed in the camp overlook the supposed extermination? Why did Heinrich Himmler issue an order that "the death rate in the camps be reduced at all costs"? Why did the Germans build huge hospital facilities in the camps to put sick Jews back to work? As for the argument that too many people would have to be involved for such a conspiracy to work, that same nonsensical argument was made over Pearl Harbor. I doubt that you will let this post stay up, Miss Harrington any more than the last one. It would raise all the questions you cannot answer - which is why you confess intellectual impotence by deleting them. Thank you very much. I was a little concerned that I sounded patronizing. That was never the intention. It was to point out all of the tricks and sleight of hand tactics, so the comments section here will become a repository of such for any future readers too. You are doing good job enlightening us as to the techniques of deniers. I would never have known the scale of denial or the malevolent intent behind it until too late. I think that you have alerted us to be aware of the ways in which lies and linguistic deceptions are inserted into the argument.